French presidential candidate Emmanuel Macron’s campaign team, which rejected accreditation and accused RT of spreading fake news, has literally hung up on the request to clarify why they refuse to honor freedom of the press. Macron’s spokeswoman did not last on the phone for a minute, and hung up the moment she discovered she was being asked for a comment from the political movement’s apparent arch-foe, RT, which En Marche! a day earlier called a “two-headed entity” engaged in state propaganda and fake news. Refusing to speak to RT, the spokeswoman asked to send her an email and patiently wait for their comment – despite being told that several previous letters from RT were left without an answer. Seconds later, she hung up under the pretext of being outside of the office and having bad phone reception. Although the spokesman failed to provide any specific examples of Russian media spreading fake news, he hinted that Macron’s position on Russian media won’t change. 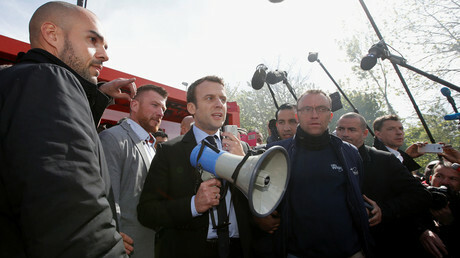 “If this creates problems with the Kremlin, it will be the subject of an open discussion in the event of the candidate (Macron) being elected,” the spokesman added. So far, RT has not received any comments from Macron’s camp, despite numerous attempts since last Sunday to clarify the situation. 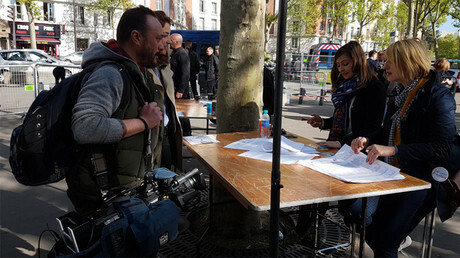 On Wednesday, RT caught up with En Marche’s spokesperson at Whirlpool tumble dryer factory rally in Amiens to ask when the channel will be accredited. “Will you finally accept the accreditation request by RT?” the RT correspondent asked. Twisting and turning the spokeswoman refused to comment, dodging the question. Seconds later, she just walked away, saying she had “work” that needed to be done. “M. 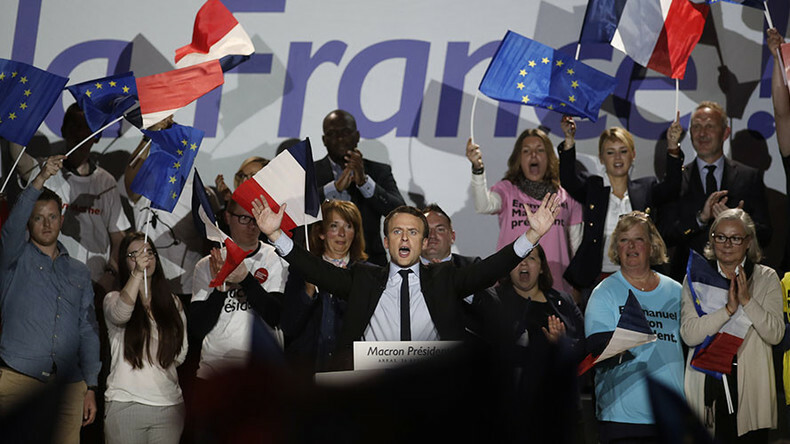 Macron wishes to underline his attachment to the campaign against Russia. When Western countries make allegations they never provide any evidence. It is not the point. The point is to get to the news showing he is anti-Russian,” Robert Harneis, an independent journalist, told RT. Moscow views En Marche! attitude towards RT and Sputnik as a violation of freedom of speech and freedom of the press. RT asked Reporters Without Borders, Reporters Committee for Freedom of the Press, and Committee to Protect Journalists to issue a comment and intervene. RT also appealed to the Freedom of the Press Foundation, International Federation of Journalists and International Media Support to assess Macron team’s actions. Zakharova called on the relevant French authorities and international organizations to ensure that freedom of the press was upheld in the second round of voting. Macron just seems to be riding the wave of an anti-RT campaign in the West just to score some political points, Martin Summers, a writer and broadcaster, has told RT. “There has been a general witch hunt against RT. The impression is of a certain childishness in response to RT. It is partly due to the fact that RT has become a whipping boy for mainstream pundits and politicians,” Summers told RT. “There is a kind of collective hysteria that has developed in the ruling circles in the West, and in a way a backhanded compliment to RT because then they presume that RT has this huge influence,” Summers added.